Oblong- to bottle-shaped, delicata squash has a milky skin with variegated green-to-orange lengthwise seams. Inside is golden flesh whose sweet flavor and luscious texture recall both yams and butternut squash. This recipe nestles rings of orange-roasted delicata on a bed of lemony polenta and tops the dish off with a bold-flavored, grassy-green olive tapenade. Prepare the tapenade: Combine the olives, shallot, capers, sun-dried tomatoes, wine vinegar, olive oil, and pepper flakes in a bowl, mix, and let stand at room temperature for one hour before serving. Make the squash: Preheat the oven to 350 degrees. Slice the squash into ½-inch rings. Use a spoon to remove and discard the seeds and stringy bits, then put the squash rings in a low-sided roasting pan or baking dish. (If the pan is too deep, the squash will not brown properly.) Add the olive oil, tossing to coat, then lay the rings flat and season with salt and freshly ground black pepper to taste. Squeeze the orange over the squash (discarding the fruit) and top with the thyme sprigs. Bake the squash for 20 minutes, or until it is golden and soft to the touch. Remove the squash from the oven and discard the thyme sprigs. Assemble the dish: Spoon the polenta onto individual plates. Grate Parmesan cheese, if using, over the polenta. 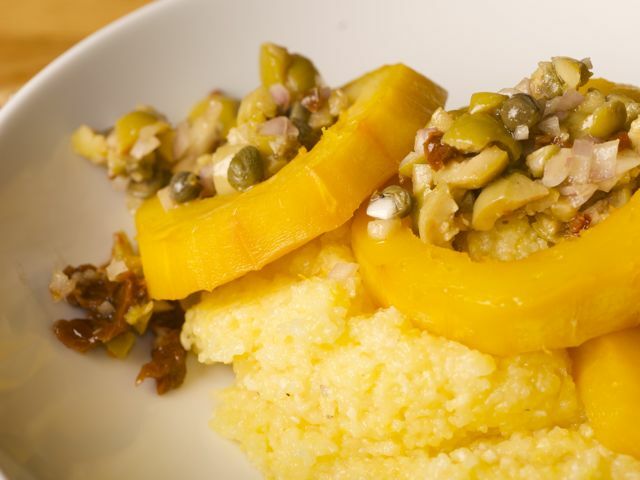 Place a few delicata rings on top of the polenta in an overlapping pattern. (Alternatively, you can slice the rings into cubes and fold them into the polenta.) Spoon green-olive tapenade over the top and serve.